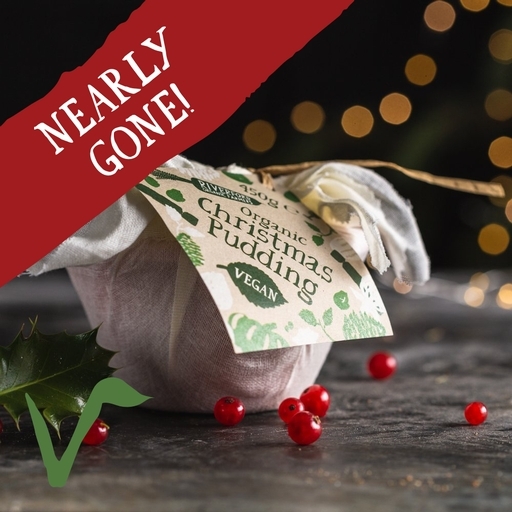 A traditional, richly fruity Christmas pudding to finish off your vegan feast a treat. Our special recipe uses coconut oil instead of butter, with grated apples, warming brandy, spices, and a generous mix of vine fruits. You’ll find room for this one after Christmas dinner! Serves 4. Remove label. Steam pudding in its muslin wrapped basin for 1 hour. Flame with brandy and serve. Our Christmas puddings are made for us from scratch by Crosbies, a family-run bakery who only use high-quality, natural ingredients. This vegan recipe is our own, specially developed to be just as tasty as a traditional Christmas pud. Sugar, raisins, sultanas, beer (water*, barley, sugar, yeast, hops), currants, breadcrumbs (wheat flour), deodorised coconut oil, self raising flour (wheat flour, mono-calcium phosphate*, sodium bicarbonate*, calcium*, iron*, thiamine*, niacin*), apple, mixed peel (orange, lemon, fructose syrup), brandy, lemon zest, orange zest, mixed spice (coriander, cinnamon, ginger, nutmeg, fennel, cloves, cardamon), nutmeg, cinnamon.